I am in the process of making some classroom decor packs. The first one I completed is for a birds theme décor set. I plan to do an owls set, jungle set, Hollywood set, polka dots set, and chevron sets. Here are some preview pics. I have marked it on sale for the first week at 25% off. 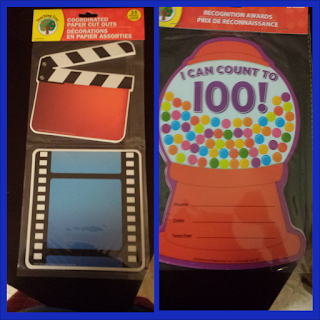 So excited to use those cut outs in my Hollywood/Movie Themed classroom. I will use the gumball certificates on the 100th day of school. Now I feel like I need to go to all of the Dollar Trees to see what else I can find. 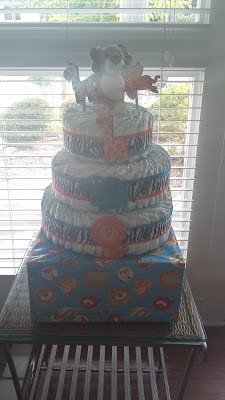 I had a great time planning a baby shower for my best friend. Here is the diaper cake I made. It was my first one. I already have someone that has asked me to do one for a shower they are planning. :-) Sorry for the bad lighting. Have a great rest of the day!!! Beautiful decor pack. Sweet, sweet birdies! I was very pleased to find this site. I wanted to thank you for this great read!! I definitely enjoyed every little bit of it and I have you bookmarked to check out new stuff you post. Superb work you have done then shared with us Thank you so much.